The Happy Girl Blog: Quickly! 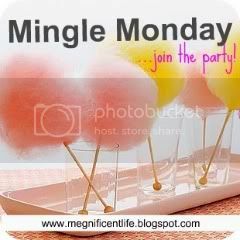 Hope you are participating in Mingle Monday this week, I am!! ~Two 10 hour days back to back to exhausting. ~Catching up with Michelle after her hair appointment was fantastic, love that girl! ~Yelling Talking very loudly in a crowded Aqui makes your throat raw and scratchy. ~Celebrating a sister-in-law's birthday with brownie bites is fabulous. Even more so when the hubby is the one doing the baking, giving me a break! ~It's oddly warm today, with intermittent rain. Do not like. Hey Adrian! Im here from Mingle Monday! I love your blog and your 101 in 1001! Also Im going to start following your blog because I want you to get to 100 followers and because your blog is so awesome! No Trespassing? Mud it is! Recipe review and a giveaway! Food on the brain, a weighty issue.